A Valentine's Day gift from my dear friend, Cindy, arrived by way of my traveling husband yesterday. And I just can't help myself when it comes to jewelry this adorable. I must post about it here. These earrings will become, doubtlessly, my favorites. A nd I know what you're thinking. Audrey, are you going to turn into one of those bloggers who posts pictures of herself wearing cute stuff every day? Not enough cute stuff! I'm no fashionista. I'm a t-shirt and jeans girl, so my fashion choices aren't worth noting either way. I have friends like Jeanette ( Teak and Turquoise ) and Rachel ( My Blog. My Show. ) who do such things, and as they are adorable and fashion savvy, I look to them for inspiration and beauty. So why put this picture up here at all if I'm not into fashion blogging? To that I can only say that these earrings are special. Not only are they pretty, but they are constructed from tiny resistors! That's right, they're geek jewelry! See? Absolutely worth blogging. Besides, I want to put these up on my Pinterest style board , but that means I have to put the image and info somewhere first. 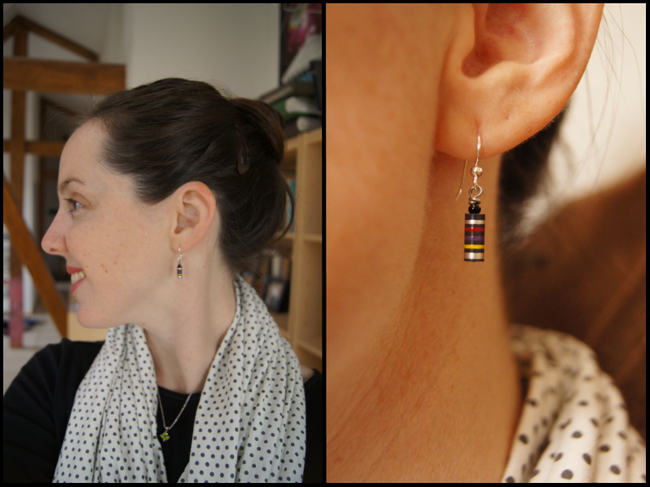 Turns out, these earrings aren't easy to find on the internet. The first mention I found is in a Society of Women Engineers newsletter put out by UC Berkeley. The second is a Facebook gallery of like-jewelry constructed of itty bitty computer parts. And it's no surprise you can find these on Etsy, too . However you hunt them down, it'll be worth it. Like most technological advances, these babies go with everything!